It was 1962. Mercedes had already given up on the gullwing, the last one they made was ’57 (not counting the modern ones) . But somehow Ford got the word late on this flashy door style and got one made in ’62. The weird thing is, when I researched this car, I came across the name of my old friend customizer Dean Jeffries. I thought the only connection he had with Ford was the custom car he built for the Ford Custom Car Caravan in the mid-‘60s and painting Shelby’s first Cobra yellow (and various other colors every few weeks to make people think there was more than one Cobra). But evidently he built this one off car, using doors similar to the Mercedes ’55 through ’57 gullwing (production models), though not quite as efficient, the gullwing from Stuttgart having shorter props to hold the doors open. The chassis was a T-bird. And that’s weird too because the two seater T-bird ended at ’57 so what year chassis was this? The engine was a 6.7 liter V8, which probably translates to 406 and the name of the car was Ford Cougar 406 Concept. What is curious about the car is how “behind” it was in styling, like something from the year 1954, all doughy and rounded. It did have pop up headlights, its only modern feature. This car has been in the back of my mind for decades, I think I saw it for a few seconds on screen when Jack Lemmon drove it in the movie Under the Yum Yum Tree. I think the car was deep-sixed, melted down or otherwise destroyed, but Ford surprises me once in a while by coming up with some old dream car that I thought was long since gone. I remember one time borrowing a big ring of keys from a Ford official and checking out various buildings near The Glass House (their World HQ) and each one was chock full of dusty old dream cars. Maybe this first Cougar inspired me to buy a gullwing (the Mercedes variety) only five years later. But gullwings aren’t the cat’s pajamas you think they are. You can’t roll down the side glass, and oh, sometimes they open by themselves! THE AUTHOR: Wallace Wyss is the author of 18 car books and co-host of the Autotalk show broadcast weekly from KUCR FM radio. 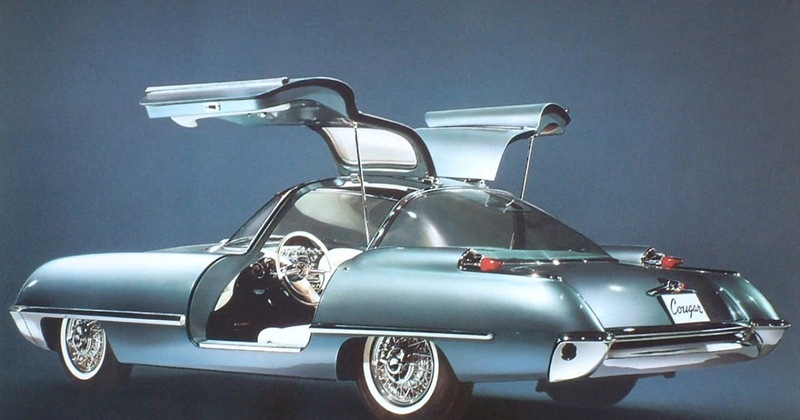 The custom car builder Dean Jeffries built this gullwing concept car for Ford. I see it as not so bad. Probably some spare time inside Ford’s Design, and one more concept was ready on drawings. There was time and money in excess, and that’s why these kind of thing is so interesting today. How we arrived at so many antiseptic SUV’s today??????? The car is quite handsome and did not deserve to be scrapped although I can see where Ford would feel like at the time they laid a time capsule egg… still all these years later it would be fun to see the car. Fun still would be knowing what chassis it had actually been built on. Sure a waste to spend all that money only to scrap a very neat car. I agree with Valter Prieto’s term antiseptic SUV’s made me smile for sure. Would be neat to see a very comprehensive set of pics of the car. I agree with Valter. Maybe it was “behind” the styles of that time but it looks cool today. It is different like a lot of cars of that period, Corvette being one. The vast majority of today’s cars are, in a word, boring, Including cars from Maserati, Ferrari, Porsche, GM, Ford, etc. Mercedes does have some really great looking cars but no one offers anything outside–the-box outrageous. After reading Mr. Wyss’ article I picked up an old, 3/2018, Hemmings Classic Car magazine I hadn’t yet read. I’m a little behind in my reading. Wow, Bruce – that sure looks like our subject car to me. Internet is really great isn’t it? George Barris was given some old Ford show cars by Ford including the Ghia-built Futura which he didn’t know what to do with until the Batman TV show came along and suddenly it was the Batmobile. Decades later he sold it for over a million. So I think this old picture might be the car. Good detective work. Now finding out where it went from there? It is too bad that this car never made production. If it had been built in any kind of volume just imagine what a great platform this would be for a restomod project today! With a modern chassis and powertrain and some interior updates this would be a great touring car.